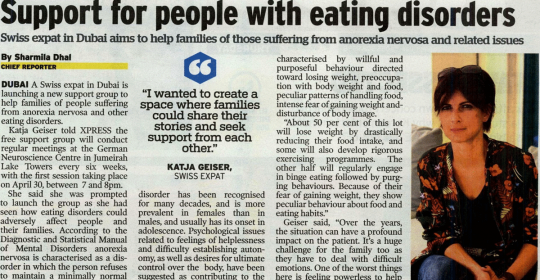 A Swiss expat in Dubai is launching a new support group to help families of people suffering from anorexia nervosa and other eating disorders. Katja Geiser told XPRESS the free support group will conduct regular meetings at the German Neuroscience Centre in Jumeirah Lake Towers every six weeks, with the first session taking place on April 30, between 7 and 8pm. She said she was prompted to launch the group as she had seen how eating disorders could adversely affect people and their families. 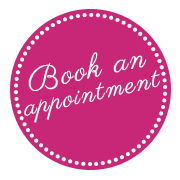 According to the Diagnostic and Statistical Manual of Mental Disorders anorexia nervosa is characterised as a disorder in which the person refuses to maintain a minimally normal weight, intensely fears gaining weight, and significantly misinterprets his/her body and shape. He said anorexia nervosa is characterised by willful and purposeful behaviour directed toward losing weight, preoccupation with body weight and food, peculiar patterns of handling food, intense fear of gaining weight and disturbance of body image.